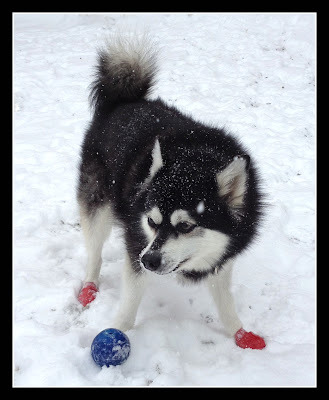 Mark's Dog Blog: Should Dogs Wear Booties In The Snow? I have Two Alaskan Klee Kais - better known as miniature huskies. Thinking that they were a northern breed of dog, bred down from the Siberian Husky, I assumed that they would have no issues with the snow. Makes sense, right? For the most part, this is true. I never thought I would ever buy shoes for my dogs. It just wasn't me. Upon waking one winter morning, I could see from my window there was at least a foot of snow on the ground. I was excited to take Xander out. It was his first snow, and I thought he was going to have a blast. I couldn't wait to get him out in it. There is a huge field about two blocks from my house that always has huge drifts of snow in the winter. I thought that would be a great place to take him, so out the door we went. In Boston, snow removal is fast. As soon as the flakes are hitting the ground (sometimes sooner), the plows get to work, clearing the roads and trying to keep the sidewalks walkable. Right next to the field mentioned above is an elementary school. To make sure it's safe for the students and teachers, city workers do a great job shoveling the snow. Unfortunately, they don't stop there. They then put down a layer of salt - at least an inch thick. As we approached the field, I started to walk Xander over the salted area. There was a tug on the leash - he had come to a complete stop. I was puzzled, and I tried to convince him to continue. He refused to move, just stood completely still as if in a trance. Then he made this awful sound. It was a cry, and it was pretty obvious that he was in terrible pain. At that point, I was still confused and beginning to panic. I didn't know what was wrong, and his cries were getting worse. He then dropped on his chest and somehow managed to get all four paws off the ground. That's when It hit me - it's the F-ing salt. I quickly picked him up, ran across the road, and dropped him into a snow bank. I frantically rubbed the snow into his feet in the hopes of making the pain go away. All the while, he was crying and wailing like a banshee in my ear. Since then, I have seen how terribly ice melt can affect the majority of dogs, no matter the breed. Every once in a while, I come across one canine who doesn't seem bothered by the salt, but they're the lucky ones. Most hate the stuff, and with good reason. So that's why I use booties. Personally, I wouldn't waste money on expensive sets of dog boots. More than likely, one will be lost on the first outing, and what can you do with 3 boots? Trust me, it cost me hundreds to find this out. I use and would definitely recommend Pawz. These brightly colored rubber "balloons" are reusable (they last a surprisingly long time) and disposable (they're biodegradable). They come in packages of 12 so when one wears out or goes missing, you have spares. So the answer to my own question, yes - dogs should wear booties. But mainly for the salt.